PYEONGCHANG, Gangwon Province -- As Fiat Chrysler Korea eyes to make the most of South Korea’s growing sport utility vehicle market and boom in leisure activities, the sixth-generation JL Wrangler was launched here last month amid high expectations from the carmaker and local off-road adventurers. The fully changed Wrangler is back in the market 11 years after the mega-hit fifth-generation Wrangler was launched in 2007. It boasts upgraded off-road driving performance, convenient driving functions for on-road, and a revamped design. Staying true to its roots as an off-roader and compact military car for American soldiers made during World War II in 1941, the new Wrangler Sahara showed outstanding driving performance and powered across bumpy hills and large puddles of water in a media test drive at Heungjung valley in Pyeongchang, Gangwon Province, last month. The four-door gasoline Sahara easily roamed through the off-road course made up of narrow rock crawling on the four-wheel low mode, and winding mountainous uphill on the four-wheel high auto mode. It also swiftly powered across streams. According to the carmaker, the new SUV can cross waters up to 76.2 centimeters deep, due to 39 millimeters higher minimum ground clearance of 269 millimeters. During the uphill course with inclination of about 45 degrees, the vehicle maintained same power and stability as it did on-road on the 2.0 liter turbocharged four-cylinder gasoline engine and eight speed automatic transmission, producing a maximum of 272 horsepower and 40.8 kilogram-force meter of torque. In terms of exterior design the new Wrangler spells “Jeep,” succeeding the concept of the Jeep CJ launched in 1945, with the signature seven-slot grille, round head lamps and the rectangular headlamp in the back. The interior went through a sophisticated transformation from the previous rather clunky design. An 8.4-inch touch screen is placed at the center console along with a 7-inch digital cluster display. Going along with its off-roader identity there is a drain plug inside the vehicle, enhancing convenience for an interior car wash.
To appeal to a wider range of drivers, the new SUV has a total of 75 safety and convenient features for daily driving. 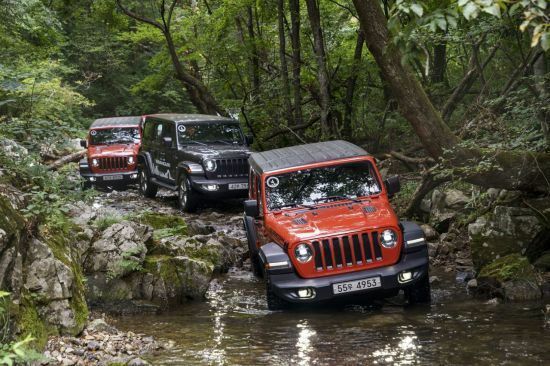 Four trims of the new Wrangler -- the Wrangler Sport, Wrangler Rubicon, Wrangler Rubicon high and Wrangler Sahara --are offered here, priced between 49.4 million won ($44,205) and 61.4 million won.